Want a zoom range that will compete with your local neighbourhood paparazzi, but don't want the £10,000 expense or bulk associated with an equivalent interchangeable lens for a digital SLR? Canon's PowerShot SX40 HS bridge camera pitches itself as a capable all-in-one 'super zoom'. Its 35x optical zoom cannot be swapped, but it offers a massively broad 24mm to 840mm focal range in 35mm film terms, ensuring it's capable of shoehorning in everything from wide angle landscapes to pap-style candid close ups. Maximum lens aperture is a reasonably bright f/2.7. Sounds good, but it's not the only such camera out there. Fuji's FinePix HS20 may offer 'just' a 30x optical zoom, but its construction makes the Canon feel quite plastic-y in comparison, plus the Fuji's own zoom can be turned manually for more precise control. Here a zoom lever does the same job, lens gliding forward or retracting back in incremental steps, with range markers provided on the lens barrel. Also competing for market share are the Olympus SP810UZ, also 30x, plus the 24x Panasonic Lumix DMC-FZ150. In addition we have the Nikon's Coolpix P500, the Canon's closest rival, which pips it at the post only in its claim of a 36x optical zoom and a wider starting point of 22.5mm. A 12.1 megapixel effective resolution is offered from a backlit CMOS sensor that should ensure there's not too much visible noise at higher ISO (low light) sensitivity settings. This, surprisingly, is a drop from its SX30 IS predecessor's 14.1MP, which offered the same lens reach. It's worth noting that you've got to actively want a big zoom to stomach the SX40 HS' price tag. For its manufacturer's suggested £459 you could alternatively buy the proper digital SLR the camera outwardly resembles. Yet you'd still be stuck with a beginners' standard lens kit offering a miserable 3x optical zoom in comparison. 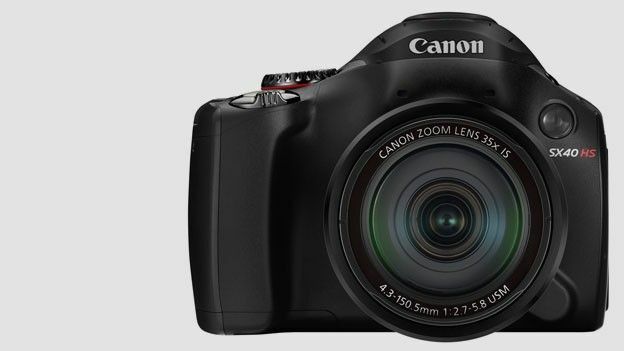 The Canon PowerShot SX40 HS is for those who feel bigger is better in every sense. There's a substantial handgrip with non-slip roughened surface around which we managed to fit three fingers, and the camera is bulky like a mini DSLR. Though the Canon looks plastic-y, with its chunky rechargeable battery and removable SD media card inserted into the base of its handgrip, the initial impression is one of reassuring robustness. With a DSLR-like weight of 600g, this is a camera that could withstand a few knocks, as long as none of them were to its lens barrel when fully extended and therefore in its most vulnerable state. Buttons and controls are large and obvious, their complexity and number falling between the layout of your average compact snapper and a digital SLR proper. There's a chunky shooting mode dial the size of a ten pence piece which boasts 11 selectable settings running the gamut of manual to intelligent or 'smart' auto, plus a shutter release button the size of a 5p at the top of the handgrip, where you can't miss it. This button is ergonomically encircled by a lever for operating the zoom. Despite the camera's professional looking exterior, there's only the option to shoot JPEG stills here; there's no top quality Raw option in addition, as found with digital SLRs. The Canon PowerShot SX40 HS' 2.7-inch LCD screen is here of the extremely useful flip out, angle-adjustable variety. This means that not only can it be tilted if sunlight affects visibility – it can additionally be used to frame up those otherwise awkward angles that we never would normally attempt to shoot from. In tandem with the grip at the right hand side, holding the edge of the screen also provides a further aid to steadying the camera for those long lens shots. Though screen visibility is OK, we could have done with a higher screen resolution than the standard 230k dots offered here. For the asking price we'd have expected at least 460k dots. Directly above the monitor is the alternative option of framing shots using a much smaller electronic viewfinder, or EVF. This offers a so-so 202k dot resolution so is easily overlooked, especially as there's no dedicated button for activating it nor is there an eye sensor that switches it on automatically as the user brings an eye level with it. Instead it switches on only if you turn the main LCD screen to face the camera body, putting it out of option. The camera powers up from cold in two seconds, back screen bursting into life while lens extends to maximum wide-angle setting. In still photo mode it is possible to power through the Canon's complete focal range, from extreme wide angle to maximum telephoto setting in three seconds if maintaining a finger on the zoom lever. If recording video at the same time this noticeably slows to almost a triple duration, so that the sound of the internal motor strutting its stuff is less intrusive. The Canon's suffix has with this iteration changed from IS (image stabilised) to 'HS' (High Speed) in reference to the fact it is one of the very first Canon models to incorporate a new Digic 5 image processor, said to be 75% better than the Digic 4 for noise reduction in lower light shots. This new engine has also enabled it to offer a host of quick fire capture options, including a continuous still photo burst frame rate of 10.3fps, albeit for up to eight sequential shots. If recording video – simply hit the record button no matter which alternative setting has been selected on the shooting mode dial – and there's the option to shoot at 240fps, if inevitably with a reduced resolution of 640x480 or 320x240 pixels that delivers slow motion results. Full HD 1920x1080 pixels video is otherwise offered at the standard 24fps. The chunky NB-10L rechargeable battery which here is inserted into the base of the handgrip thereby lending the camera added heft, offers 380 shots from a full charge, which is more than respectable, even for an enthusiast model. Amateur wildlife or sports photographers, as well as families with unpredictable tots will get the most out of the broad zoom range on offer here, and the ability to adjust framing in an instant. However despite image stabilization built into the lens, we struggled to get razor sharp shots at maximum telephoto when shooting handheld in daylight. This proved less of an issue when we were trying out the slow motion video options – fun and effective as it happens – as resolution is lowered anyway, so pin sharp footage isn't the chief concern. Unless we were shooting under blue skies and ideal conditions which unsurprisingly delivered the very best results, pictures from the Canon were a little flat looking straight out of the camera, so we adjusted contrast in Photoshop to boost definition and add extra impact. For those who do want to achieve natural looking available light shots and avoid using the Canon's built-in pop up flash, here the ISO range tops out at ISO3200 which is respectable if no great shakes on paper. In practice however we were not noticing noise/grain becoming an issue until ISO1600, while at top whack ISO3200 results look even better, due to a large extent noise reduction processing kicking-in in earnest. So if you have either a steady surface, steady hands or are prepared to lug a tripod around with you, the Canon PowerShot SX40 HS is capable of coming up trumps for a wide variety of shooting scenarios. Just don't expect razor sharp results on a par with the digital SLR you could otherwise buy for the same money. For those photo opportunities when shuffling your feet forward or back in order to get the framing you want simply isn't an option, the Canon PowerShot SX40 HS delivers the goods with its extremely broad focal range (not to mention tilting LCD screen) meaning that it's hard to exhaust the creative possibilities. A whopping £10 cheaper than the Panasonic Lumix DMC-FZ150 that offers a 'mere' 24x optical zoom, by comparison the SX40 HS could be seen as fair value, though we'd recommend hunting around for an even cheaper street price before parting with cash. As we noted at the outset though, you've got to really want and make use of the zoom range on offer here to spend the same as an entry level digital SLR on a camera that isn't expandable in any way.